South Korea’s auto giant Hyundai Motor Co. pledged investment in the country’s second-largest car-sharing service provider Revv to make headway in the potentially explosive mobility segment in the world’s second most populous country. The carmaker announced Monday that it has made a strategic investment in Revv to develop a new mobility business model and ramp up capability and technology to lead the future mobility market. The company did not disclose the investment scale. Founded in 2015, Revv has been providing ride-sharing service in 11 cities in India and expanding its presence in the industry faster than any other rivals thanks to its innovative and differentiated services, Hyundai Motor said. Hyundai Motor has become the first finished carmaker to make an investment in Revv. 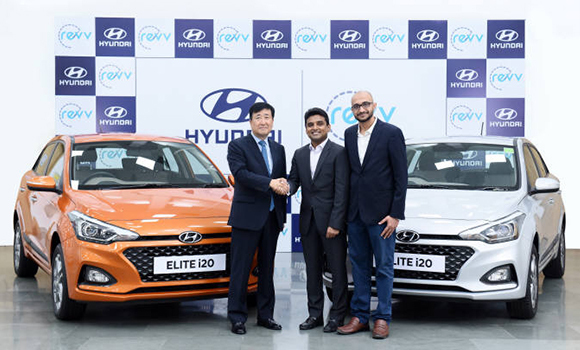 “The investment would help Indian customers to experience Hyundai in a different way and raise our brand awareness in the market, which ultimately would lead to sales increase in India,” an official from the company said. The ride-hailing market in India is estimated to grow from $900 million in 2016 to $1.5 billion in 2018 and $2 billion in 2020. Industry watchers also predict that the car-sharing market in the country would expand from current 15,000 vehicles to 50,000 by 2020 and 150,000 by 2022. As part of efforts to strengthen its mobility business, Hyundai Motor last year began a car-sharing business in Amsterdam, the Netherlands, with 100 units of its IONIQ electric vehicle. It has also partnered with last-mile delivery service providers Mesh Korea in Korea and Immotor in China to enhance competitiveness in the connectivity and mobility market. Shares of Hyundai Motor closed 0.79 percent higher at 127,500 won ($113.48) in Seoul trading on Monday.